In the growing $64 BILLION haircare industry, Floyd's 99 Barbershop is a category leader with over 18 years of expertise in men's haircutting and grooming. Established by brothers Paul, Bill and Rob O'Brien, on the principle of providing great service, they created a one-of-a-kind barbershop based on a client-first approach. Our brand is positioned in the mid-priced segment of the industry but delivers service comparable to the industry's higher priced boutiques and salons. The brother's passion for service and dedication to client excellence has shaped Floyd's 99 into a category leader and created an authentic brand that draws our loyal clientele to return again and again! Floyd's 99 Barbershop is offering the opportunity to be a part of our successful franchise that's different, edgy, and just plain DAMN cool. Our shops are designed to have a fun, engaging neighborhood hangout feel with great music, high energy, and a full menu of services for men and women. This, along with our proven set of service standards, is what makes Floyd's 99 one of a kind in the industry. ONGOING TRAINING FOR STYLISTS, BARBERS AND FRANCHISEES: The Floyd's 99 Academy provides on-going advanced technical education, for stylist and barbers, and is designed to build confidence in using the tools that are necessary to create every type of haircut that our clients ask for. The education team helps staff stay ahead of the curve on the ever-evolving trends in hair grooming, styling and more. Continued education on technical skills, service standards, retail sales, and more are provided as needed. Compromised of regional and national educators, our technical education team will help screen potential technical candidates and provide on-boarding training for your staff as you prepare to open your new shop. MARKETING THAT LEADS TO REAL RESULTS: Our comprehensive sales and marketing programs deliver "butts in seats" by providing a national year-round marketing calendar, retail promotions, and tools to support local marketing. With an experienced home office support team, all marketing collateral, signage, advertising, content, photography and video are produced in-house. RECRUITING THAT HELPS YOU BUILD THE RIGHT TEAM: Our recruiting and retention team use proven tactics and tools through multiple channels to attract experienced stylists needed to grow your business. Our education team supports new shop openings by helping partners screen technical candidates to ensure experience and a good cultural fit. TAKING HOME THE FLOYD'S 99 EXPERIENCE: Clients can keep their style looking fresh by taking the Floyd's 99 experience home with the proprietary Floyd's 99 Grooming line. Additional revenue generating opportunities include Floyd's 99 branded grooming and styling products that are developed in-house and tested by our very own stylists and barbers. We also carry a mix of top performing national and international brands and continue to expand our Floyd's 99 grooming line with the launch of new innovative products. HIGH-PROFILE LOCATIONS: Real estate market analysis from an industry leader to support your site selection process as well as a nationwide team of brokers to assist in creation of your letter of intent and lease negotiations. A "GOTTA STOP IN AND CHECK IT OUT" SHOP DESIGN: Our design and construction team has been in place for over 17 years, building out all our 115+ locations with the same commitment to its unique look, feel and style, and at a cost that doesn't break the bank. Each location is custom designed for the specific building, and many have an added creative touch for the region. The interior of the shop expresses a retro vibe with a modern twist, and includes stainless countertops, a shampoo bowl at each station and plasma televisions. The walls are plastered with a time machine of music memorabilia adding energy and get a touch of nostalgia inside the shop. The murals are made of vintage rock n' roll posters, highlighting relevant artists from each region giving each space a distinctive and authentic feel. OUR COMMITMENT TO GIVING BACK: Floyd's 99 is devoted to serving our communities through our national affiliation with the Juvenile Diabetes Research Foundation where we have raised to-date over $1 million. We are actively involved in the communities where we hold a presence. Not only do we care about making a difference, but our staff is intimately connected with local charities, schools, arts programs, businesses, and local events that resonate with our clients. We are constantly striving to be "more than a barbershop"
In 1999, brothers Paul, Bill, and Rob O'Brien established Floyd's 99 Barbershop, founded on the simple idea that a good haircut shouldn't have to cost a fortune. With client experience in mind, they set out to create a one-of-a-kind barbershop. With an old school new-style mentality, Floyd's 99 mixes and old school approach to providing excellent service with the new style appeal of on-trend cuts in a high energy environment. The brothers created a place where a client can walk-in anytime and get a killer haircut with an expert stylist or barber who takes the time to understand their needs before even getting started. Passionate about providing an unmatched experience for both employees and clients, the O'Brien's have dedicated themselves to building a culture that embraces individuality and cultivates real relationships. Our shops exude a fun, edgy and genuine vibe, enhanced by the people behind the chair that really make-up and embody the culture of our brand. Our stylists and barbers are as diverse as the music posters on our walls, and we wouldn't have it any other way. Floyd's 99 has 115+ established locations and continues to grow. We attribute our success to the support of our clients, staff and strong multi-unit franchise partners. We look for like-minded franchise partners who share our same values, have integrity and do the right thing -- even when no one is looking. We give back to the communities we serve and strive toward excellence -- always aiming to grow, improve and make a positive difference, as individuals and as a company. Come join the Floyd's 99 family and be a part of something bigger than just another business opportunity. 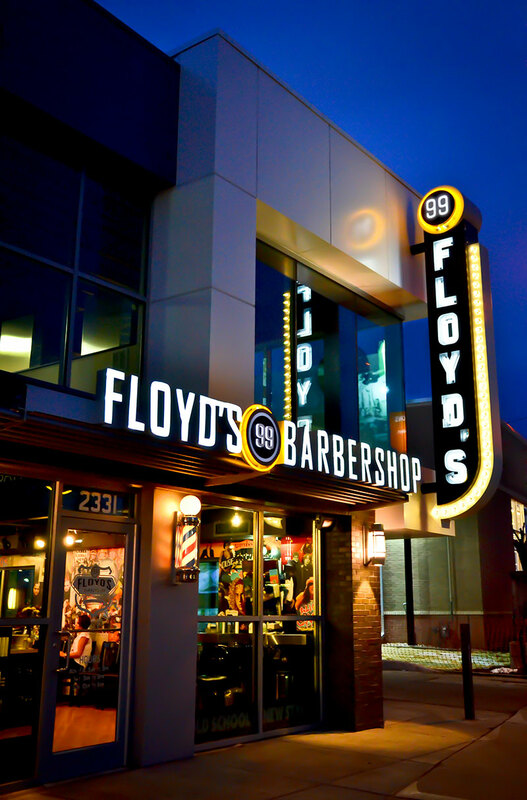 Looking for more information about FLOYD's 99 Barbershop? Take a moment to fill out our quick information request form.